January 4th, 2016 | Posted by Velda in ACUPRES.,MERIDIANS, REFLEX. Lie down on your back or sit comfortably, with your spine straight, and feet flat on the floor. Reach up toward the sky with both hands; take a deep breath, and as you hold your breath, make tight fists and squeeze, tightening all the muscles in your arms. Slowly exhale, tensing your arms, bringing your fists down, to your chest. Repeat steps 2 and 3 several times. 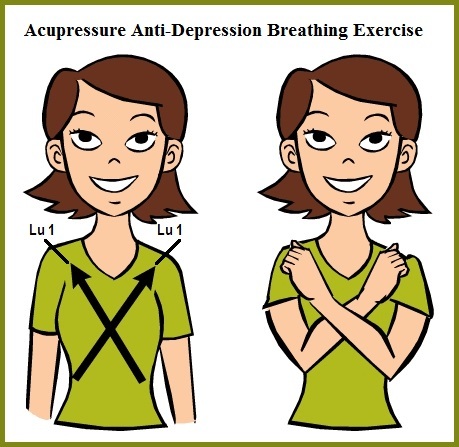 Now cross your arms in front of your chest, with your fingers touching Acupressure Points Lu 1 (shown above), Massage the tender area. Lower your chin toward your chest. Inhale four short breaths in a row (without exhaling) through your nose, filling your lungs completely on the fourth breath. Hold the breath for a few seconds with the chest full and expanded. Repeat this exercise for two or three minutes, concentrating on the depth and rhythm of the breath. 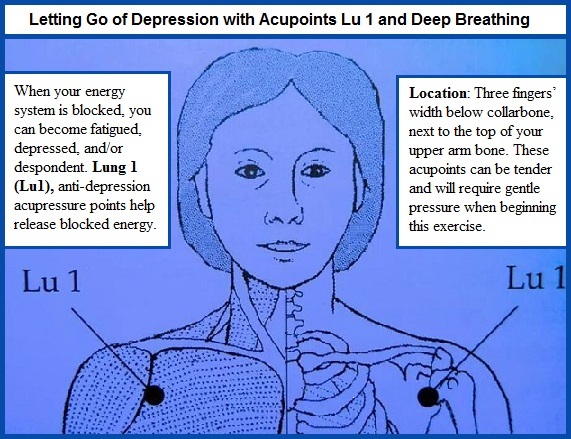 Use this Acupressure Anti-Depression Breathing Exercise as often as needed. The Brow or Third Eye Chakra is located in the center of the forehead just above the eye brows and is about insight and visualization. This is where our inner wisdom is housed. The Brow Chakra is related to our ability to see and focus on the big picture. When this chakra is open and balanced we have good intuition, experience overall good health, clear thinking and it allows us to see beyond our physical existence. If our Brow Chakra is unbalanced, we can experience problems with fatigue, day dreaming, sleep problems, and confusion. With an over active Brow Chakra one could immerse in a world of fantasy and even experience hallucinations. 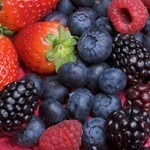 Eating dark bluish colored fruits: blueberries, red grapes, black berries, raspberries, etc. helps awaken Brow or Third Eye Chakra. 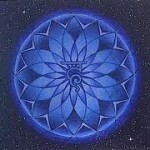 Other things you can do to increase the indigo vibrational energy: practice meditation to develop your intuition; use aroma therapeutic essential oils such as Patchouli, Myrrh, Sandalwood, and Clary Sage for balancing chakra; all the indigo colored gemstones (Azurite, Tourmaline, Tanzanite, Indigo, etc.) are associated with the Third Eye Chakra; adding indigo colors to your wardrobe can help with the flow of energy; and last choosing classical music can also enhance the energies flowing to the Third Eye.